Alone in an albergue, drinking from a 1 euro box of red wine. Welcome to the Camino, my friends. This is my Camino #3, and I suspect it’s going to be yet another strange, wonderful, unexpected and challenging journey. 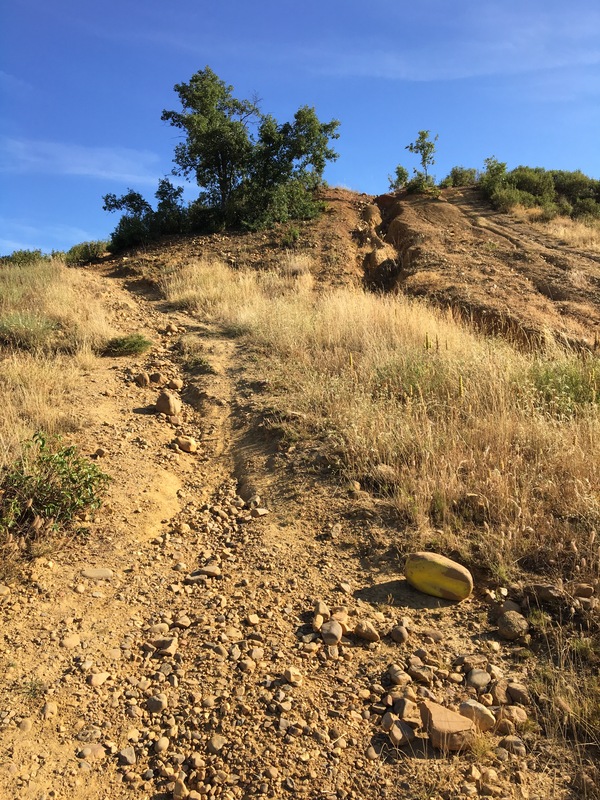 I started today- Camino guides say my distance was 27 kilometers but my phone tells me it was more like 34 (though this was with a couple small detours and some back and forths), and this was the easy day on the Camino de San Salvador. Didn’t feel so easy. But lets back up for a moment, just so I can feel like I’m sort of filling in all the gaps with my travels. I left La Muse on Monday morning and it was tough. I was up at Le Roc for one last visit and it was so hard to pull myself away, and when I finally stood to go, I started to cry. It caught me a bit by surprise, but then again, it was probably the most natural reaction I could have had. 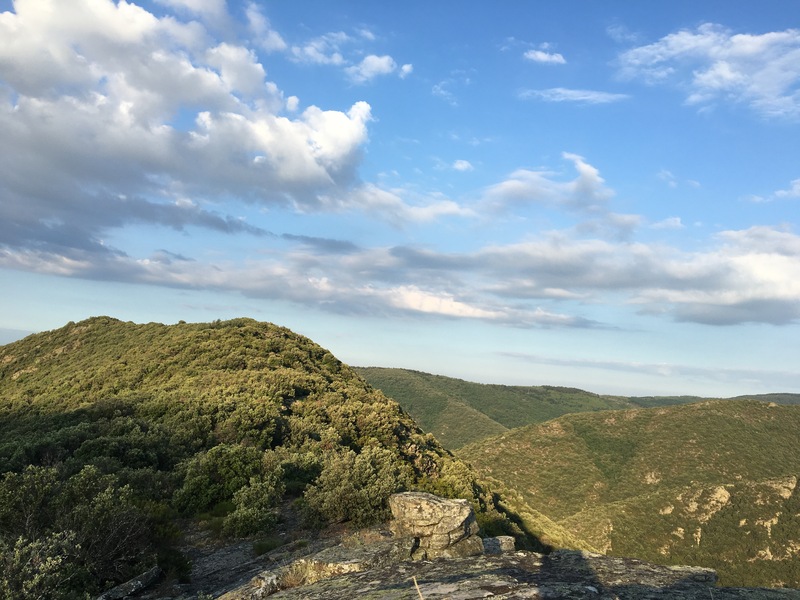 I love the mountains around Labastide, I love La Muse, and I really loved the group I was with this year. Leaving something that wraps its arms around you, holds you close and whispers, “This is where you belong, here, and with us,” isn’t easy. Not easy at all. On the Jeep ride down the mountain, on the train ride to Lyon, I tried to remind myself that I have such exciting things coming up- a Camino! A trek in Scotland! These things help, but I needed the entire day of travel to just let myself feel a bit sad, and to wonder why I was leaving. I went from the peace of a small French mountain village to the whirlwind and energy of 14 hours in Madrid. 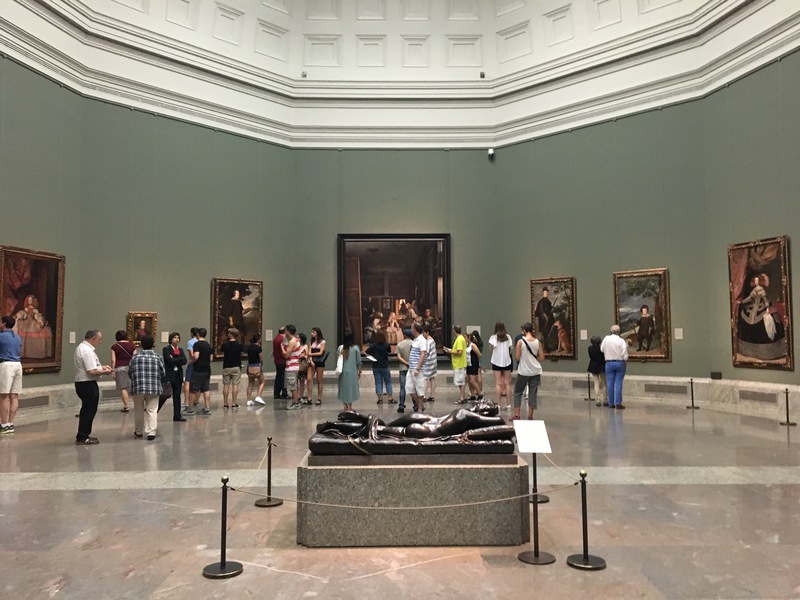 I slept for a solid 8 of those hours, and much of the rest of the time was spent visiting the Prado, and looking at yet more art that I’ve only ever seen in text books. It was wonderful. Then a train to Leon where my college friend, Lani, met me at the station. Lately, we’ve been reuniting in Spain (her work brings her here for the summers) and I really like that. We ran some Camino errands- shipping extra luggage, getting a credential- then joined her family for late night tapas in the square. It was midnight when I got back to my hostel, and I vaguely wondered about how the next day was going to go. What was I going to do? I was going to walk? On the San Salvador? How much do I actually know about this isolated, challenging route? It’s difficult for me to move from one thing to the next, to the next, without time in between to process what I’m doing. So all of a sudden, there I was, leaving Leon in the early morning hours under the light of the moon, listening to a crane’s clacking high in her nest, stopping by the first open bar for a cafe con leche. Wait, I’m on the Camino? This is the Camino? I followed yellow arrows through Leon to the Parador, where the path splits. 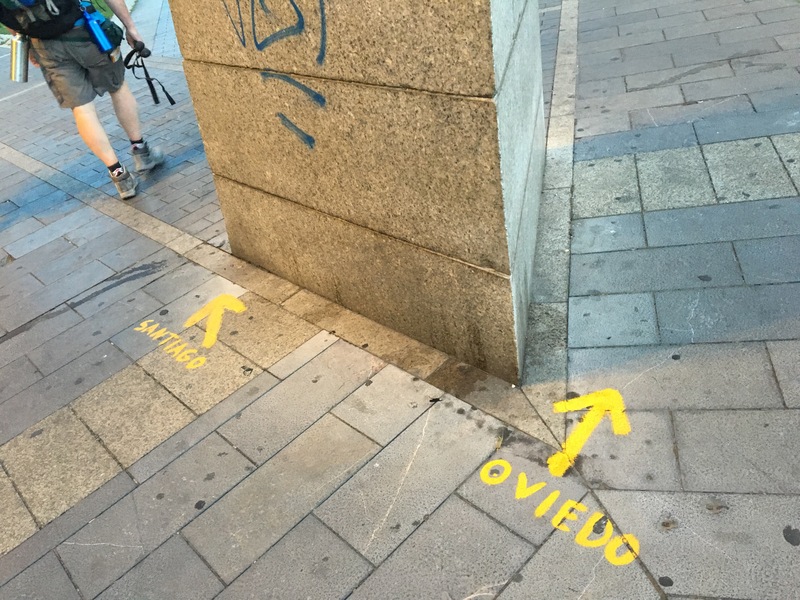 One direction continues towards Santiago- and this is the way that all the pilgrims go- and the other heads up to Oviedo. This is the way I went. I think I was the only one who walked the first stage of the San Salvador today. 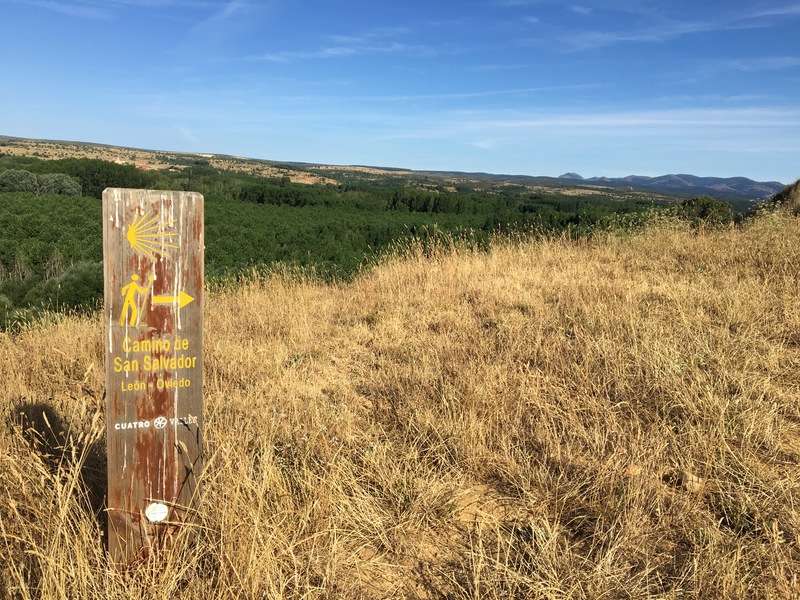 The San Salvador is a relatively short Camino of 125 km, running from Leon to Oviedo. It’s about a 4-5 day walk (or, as I’m finding out, maybe more like 5-6) and it runs through some remote, mountainous area. I’ve heard it’s difficult, I’ve heard it’s stunning, I’ve heard that not many people walk it. This first day wasn’t so challening, all things considered; aside from a few quick uphill/downhill bursts, the route was fairly flat. But man, it felt hard. Maybe because it’s my first day- I’ve had some practice in the mountains of southern France, but aside from one long day, my hikes were mostly in the range of 1-3 hours. And maybe it’s my pack- when did it get so heavy? I’ve already done two Caminos so you’d think that I know what I’m doing when it comes to pack weight, but this year… maybe I got a little too confident about what I could handle, maybe I suddenly thought that my pack could hold several more liters than it actually can. Because my pack is full, and it’s heavy. And I even forgot to stock up on a big water bottle (my back up supply), so I have no idea how I’m going to fit that in- or carry its weight- tomorrow. Or how I’m going to carry all the snacks and lunch supplies I bought (this being a remote route, I don’t want to be caught without food). These were pretty much the thoughts running through my head as I walked today, about 30 km totally alone, not passing one person: “What in the world is in my pack? Why does it feel so heavy? I’m not even climbing up a mountain, how am I going to do this? 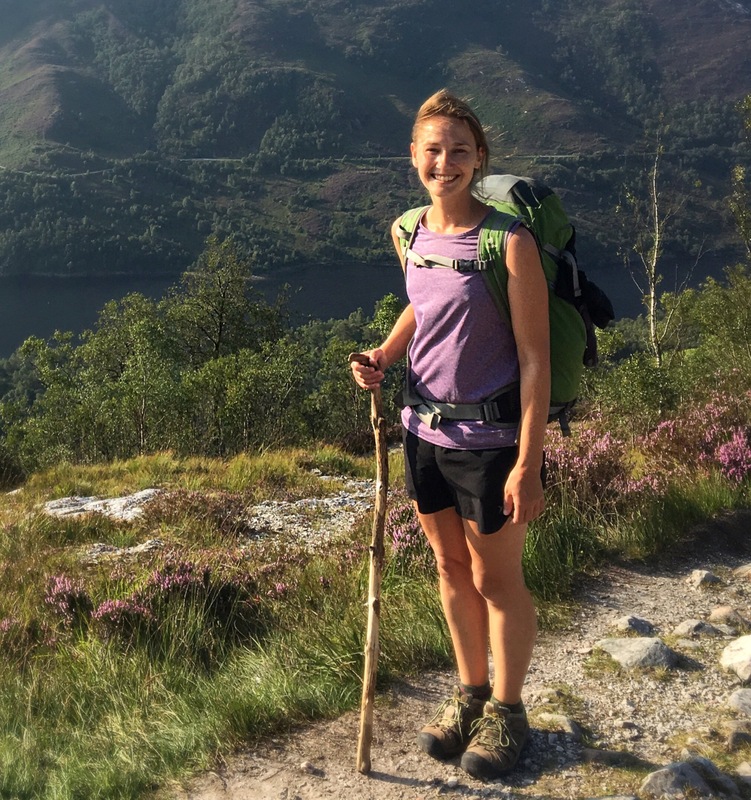 Why did I decide that this was a good idea?” I was also thinking how amazing it was to be back in Spain, to be walking a Camino again. Towards the end of the day I found a good, solid walking stick, I went a bit off route to find a bar and order a bocadillo (sandwich), my eyes became accoustomed, once again, to searching for yellow arrows. I thought I might try to walk a bit further today (and attempt to do the San Salvador in 4 days), but I was tired. The sun was hot, my feet were starting to hurt, the sunscreen and sweat and dirt felt sticky and thick against my skin. 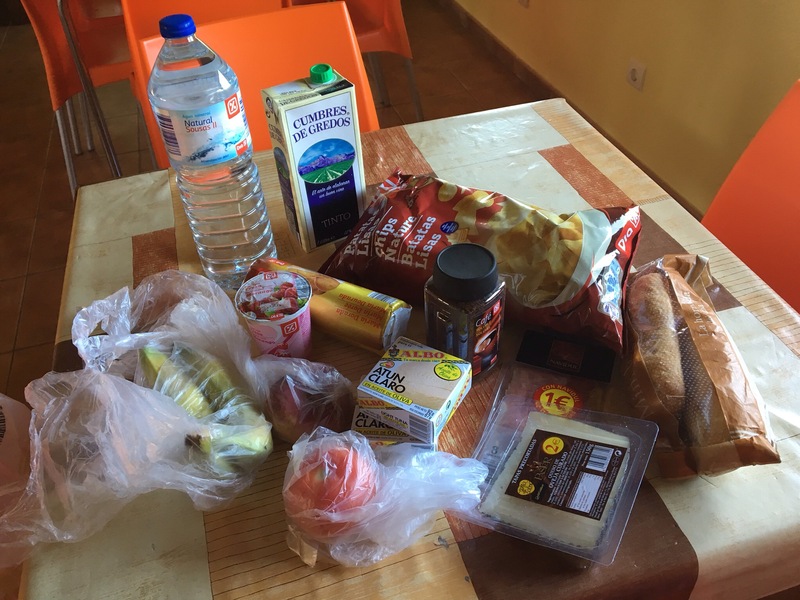 So I knew that when I reached La Robla (a small town with a few restaurants, a grocery store, an albergue), that I was going to stop. This means that I’ll probably stretch the San Salvador to 5 days (which gives me one less day on the Norte), but I think that will be okay. The albergue was shut up and locked when I arrived, so I went to the tourist office to ask about how to get in. The woman working there called, I went back to the albergue and waited, and a man showed up and gave me the tour. 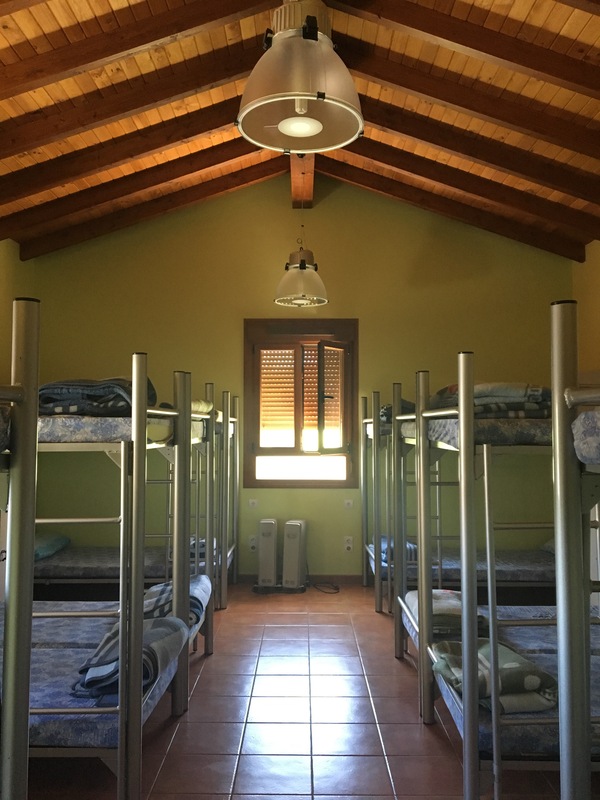 It’s a new albergue- so clean and spacious and it has the best kitchen I’ve ever seen on a Camino. The man only spoke Spanish and there were a dozen questions I wanted to ask, and so much of what he explained to me is a bit muddled. But what I do know is this: he gave me a key to the albergue and instructed me to lock up when I leave in the morning, and slip the key in a mailbox. I arrived here around 3:30 and I thought there could be a chance that others would come, but now it’s nearly 7:00 and I think I’m the only one. So I went back into town and found the grocery store and stocked up on supplies and now I’m back here, at my own private albergue; sitting on the porch in the shade, listening to the wind, drinking the 1 euro boxed wine (which surprisingly isn’t that bad), keeping a watch for other pilgrims walking down the street but I know there won’t be any. I wonder- will I be totally alone for the next 4 days? Will I be able to navigate through these mountains? Will I be able to sink into this experience, when so much of my mind is still back in France? I’m excited to find out. But for now, more wine, then some pasta and tuna fish (an old standby), and an early night. Let’s see what tomorrow brings.